NEW BRITAIN - It will be a new look for the Newington softball team this season - both in the pitching circle and in the middle of the lineup. Gone is mainstay and All-Stater Kat Lagace, whose production is going tough to replace and will certainly put some amount of pressure on the players asked to take over those roles. 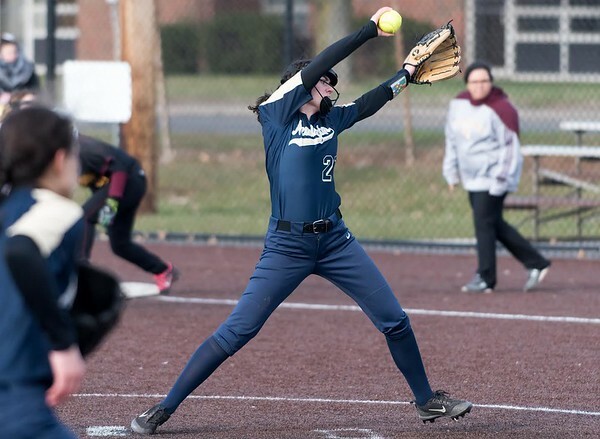 Lagace was dominate on the mound last season, which saw her compile a 2.26 ERA while striking out 160 batters in 133 1/3 innings, while finishing her career with a 1.90 ERA and 366 strikeouts in 330 innings. But Lagace also proved to be just as effective at the plate. Offensively, she hit .449 with 23 RBI and even collected her 100th career hit along the way. Lagace is currently in her freshman year, playing softball for Sage College. On Thursday afternoon, it was sophomore Danielle Pantano who stepped into the circle during the Indians’ season opener against New Britain. Pantano gave up four runs (three earned) on seven hits and struck out five over six innings of work. She also walked three. A rough first inning, in which she gave up three runs, proved to be the difference maker as Newington lost. But after that, Pantano settled in nicely. From the third inning on, the Hurricanes only managed to put two other runners into scoring position. Indians head coach Steve Markie certainly liked what he saw from his young pitcher. Newington managed just five hits and as a team, left eight runners on base throughout the course of the afternoon, while going 0-for-5 with runners in scoring position. And although the Indians didn’t open their season like they had planned on, Pantano and the rest of the Indians still have high hopes for the rest of the way. After all, there is still 18 games remaining on the schedule. Newington might have lost some key players from last season’s team, but as the Indians put it: they still expect to be contenders when the postseason tournaments come around. Newington’s next game is schedule for Monday at home against South Windsor at 4 p.m. The Indians - and Pantano - hope they can turn things around and collect their first win of the season. Posted in New Britain Herald, Newington on Friday, 6 April 2018 20:50. Updated: Friday, 6 April 2018 20:53.